One of the lies I like to tell myself about this farming thing is that we get winters off. “Sure, we put in long hours in the summer, but we get a long vacation in the winter,” I say. Pshaw. This winter, we’ve hardly had a break at all. Partially, this is because the weather has been so un-winter-like. Partially, this is because we are adding more acreage this year, so there’s more of the prep work. And partially, it’s because I’ve been deluding myself. So far this Winter, we have seeded about 33,000 onions and onion-relatives. On our farm, we use these 10×20 inch plastic trays with cells we fill with dirt. One seed goes in each cell and 4-8 weeks later, each individual plant is popped from the tray and planted in the ground. As of yesterday, we maxed out space for seedlings in our greenhouse and had to resort to some scab-shim-jimmy construction to accommodate our growing flock of photosynthesizers. What’s scary, is that we aren’t scheduled to begin putting any of these plants in the ground for more than a month. 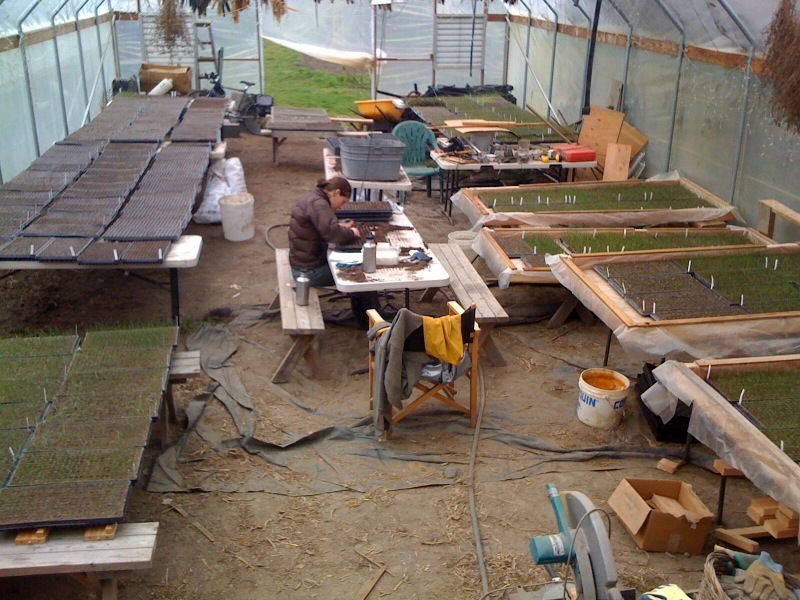 Each week, we’ll seed 40-60 flats, and each week zero will leave the greenhouse. Yikes. Much more exciting than thousands of onions… tomatoes. 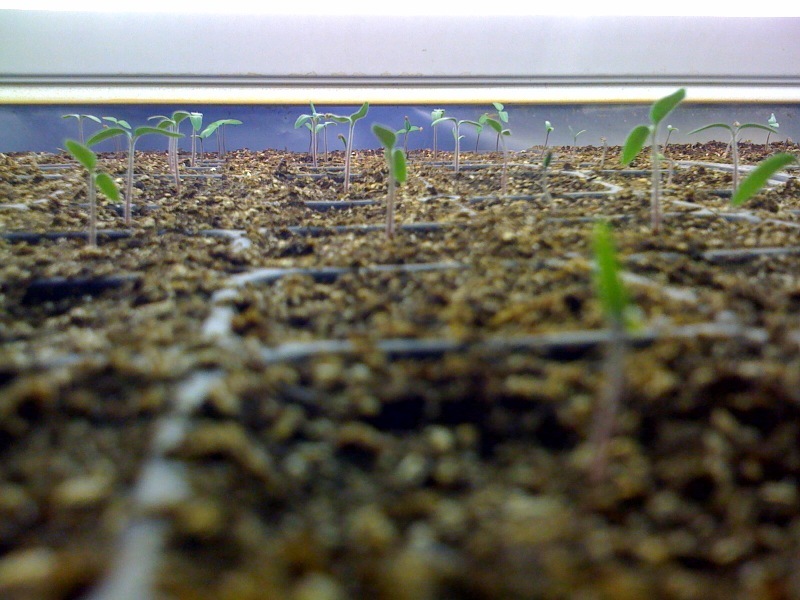 Our first seeding of tomatoes has germinated and the little viney delicacies have begun their steady march upwards – currently towards the fluorescent lights, in 6 weeks or so, towards the sun. We are so tired of eating parsnips, carrots, etc… I can hardly wait for the sweet juiciness that is tomato.